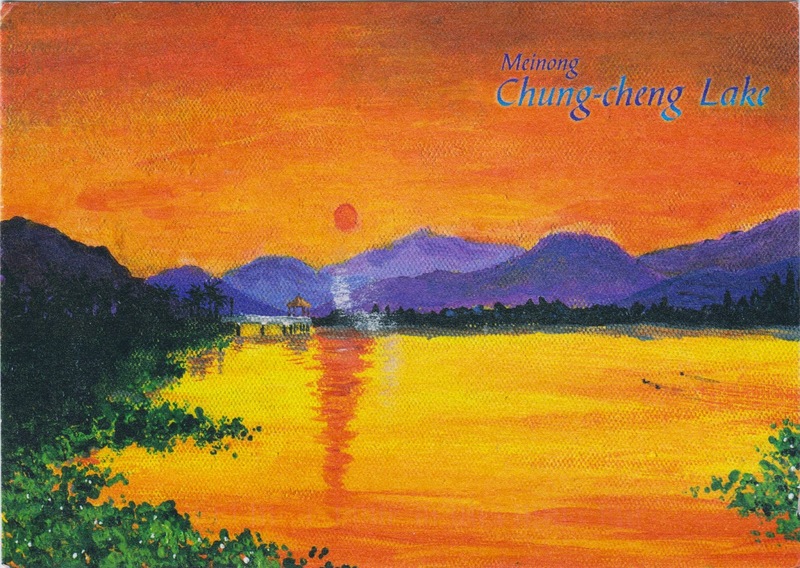 This postcard from a private swap shows the Chung-cheng Lake (中正湖) in Meinong District, Kaohsiung, Taiwan, Republic of China (ROC). A man-made lake originally built in 1748 known as Jhongjun Pi (中圳埤), it was renovated into a reservoir between 1916 and 1920 during the Japanese occupation. With an area of 21 hectares or 52 acres, the lake had a capacity to furnish water for irrigation of over 130 hectares or 321 acres of farmland. It was also used for fish farming. After World War II, the lake was renamed to Chung-cheng Lake in 1956, after Chiang Kai-shek (蔣介石: October 31, 1887 – April 5, 1975), also known as Chiang Chung-cheng (蔣中正) who was the leader of the Republic of China between 1928 and 1975. A pavilion was also built in the lake in honor of Chiang. However, there have been petitions to change the name of the lake to Meinong Lake (美濃湖) since 1996, in protest of Chiang's role in the 228 Massacre. On a side note, many statues of former president Chiang Kai-shek have been vandalized across the island around the 68th anniversary of the 228 Incident on Saturday, February 28, 2015. While the lake capacity for water supply has been diminishing due to sediment built-up since the 1957 Meinong flood, it becomes part of the largest wetland ecosystem in the area that hosts a large number of migratory birds during the winter months from October to March next year. More than 60 bird species have been spotted around the lake. A wooden boardwalk around the lake was completed last November to accommodate nature lovers.